It is no surprise to me that stuffing is America’s favorite Thanksgiving leftover side dish; it’s easily my favorite part of that holiday meal. But it’s one of those foods that is absolutely season-specific; you would never bring stuffing to a July barbecue, for example. Granted, if you did, people would probably love it, but it just doesn’t fit in without the requisite turkey and cranberries. Granted, it’s also a microwaved panini, so it isn’t going to make you forget about Thanksgiving dinner or anything. 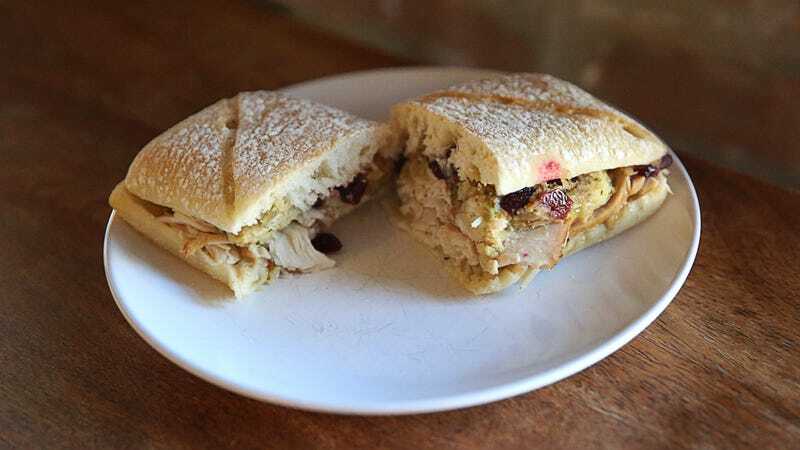 But it boasts roasted turkey, stuffing, and cranberries on a squishy panini roll, with lots of celery and sage for that extra-stuffing-esque flavor, and the sweetness of the cranberries to balance out all the savory. I’m not a huge fan of Starbucks’ other holiday offerings (not after making the mistake once of ordering the hot eggnog latte), but the Holiday Turkey Panini is my favorite fast-food sandwich of the entire year. From now until it departs at the end of the year, I’ll probably pick one up every time I head to Starbucks for coffee, just to make sure I get enough of my requisite stuffing fix in. Especially around mid-November, this sandwich is a welcome preview of the Thanksgiving deliciousness to come.